Any being from outer space who plugged into the Earth’s internet would fairly quickly conclude that our planet is inhabited 7 billion psychologists. Everyone is constantly offering opinions about the motivations and actions of others. A very small number actually get paid for their offerings which no doubt makes them feel their opinions are superior to the others. But it’s a sad fact however that the vast majority of these assessments and opinions revolve around the very limited notion of good and bad. These views may be offered in a straightforward fashion nicely embellished with expletives or they may be couched in all kinds of subtle cleverness. But the versions of psychology that underpin most of their opinions are so pathetically narrow, that it all basically comes down to whether someone is a good person or a bad person. Astrology just gives us a much broader canvas. There is an vast number of different possible angular connections between the planets so the possibilities that it allows in terms of human behaviour are so much wider. So when Capricorn Research decides to add his tuppence worth to the mix, it’s probably still armchair psychology but at least it’s of the four seater corner settee variety. But even then there are some situations where we have to acknowledge that some people are just intrinsically good and some are of the other sort. Martin Luther King and his assassin James Earl Ray would definitely come under this category. No doubt there are some people who believe that Dr King was not a force for good, but thankfully these days most of them keep that opinion to themselves. But having defined the goodies and baddies in this case, perhaps it could be instructive to step back a little and look at the astrological themes involved. Martin Luther King was an American clergyman and leader of the civil rights movement. Inspiring black Americans into action through his powerful speeches, he became a legend, whose life was tragically cut short when he was shot by Ray. King was a Sun Capricorn born at noon with the Sun therefore conjunct the Midheaven, as sure a sign as anything that he would reach the very top of his profession and would achieve high status. But the one major aspect that the Sun makes is the opposition to Pluto, an equally sure sign that his lofty position in public consciousness would be radically transformed by a single event. As ever its a T Square that shows the main thrust of his life’s work. King had Mars in Gemini showing his fantastic oratory skills but this Mars was opposite Saturn showing how he would continually place himself at odds with the authorities of his day. Saturn is the symbol of authoritarian repression and King’s Mars showed his strong opposition to it. The aspect between these two becomes a T square as the tension in the opposition is projected powerfully onto the Moon in Pisces. Of all single astrological placements, the Moon in Pisces is the most sensitive to the suffering of others and the most compassionate. He is best known for his role in the advancement of civil rights using nonviolent civil disobedience based on his Christian beliefs. This is the perfect expression of the Moon in Pisces in the 11th house of politics. The other serious factor about King’s chart is that the powerful Saturn is placed in the 8th house of death. 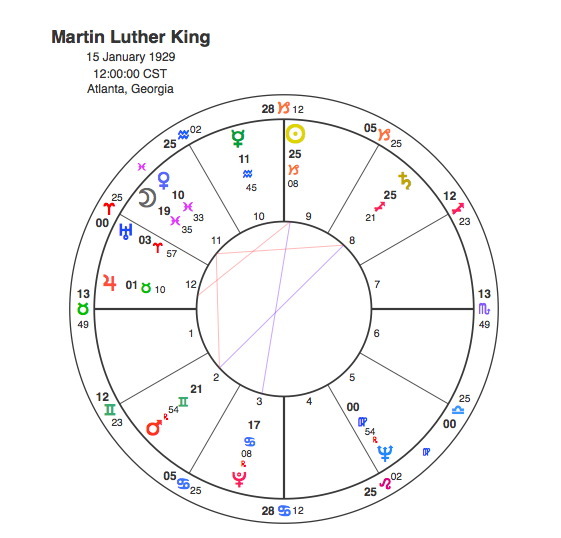 If ever someone was going to be killed ( Saturn in the 8th ) because of his speeches ( opposite Mars in Gemini ) on behalf of the downtrodden in society ( apex Moon in Pisces in the 11th ) it would be Martin Luther King. Just like the assassination of another great liberal political figure of the 1960’s John F Kennedy there is talk of a conspiracy. It appeared to suit so many people in authority to have King murdered and the question of whether James Earl Ray was acting on behalf of other people still hangs in the air. 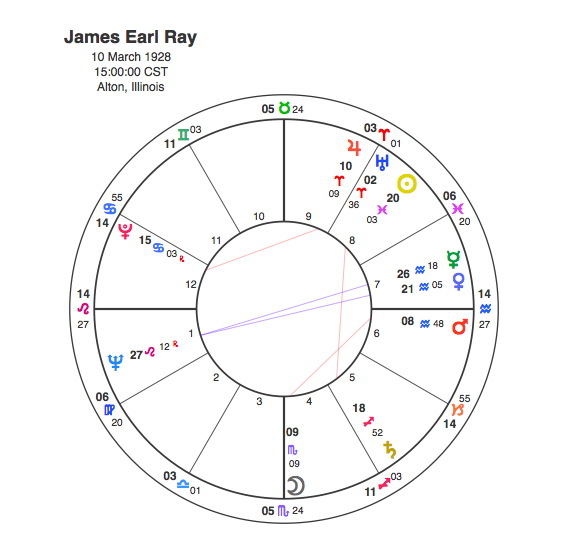 There seems little doubt though, that Ray pulled the trigger and the incredible synastry between his chart and King’s testifies to that fact. Capricorn Research has 545 charts of murderers and as most people would expect the Sun in Pisces does not come up very frequently. In fact it is the 2nd lowest Sun sign, the lowest being Gemini. Ray’s Moon is in Scorpio however which, with a score of 59 is the highest Moon sign in the group. His Moon is also in the 4th house which is the joint highest scoring house in the sample. Ray’s Sun is in the 8th house of death and it is square to Saturn. The links between the two charts are extremely powerful. Ray’s Sun is very closely conjunct King’s apex Moon. Ray’s Moon is also opposite King’s Ascendant. All of these factors strongly link the two men’s fates but its the transit that really does it. When someone has the Sun in natal aspect to Pluto like Martin Luther King, it won’t make another one for 50 odd years. King died before he was 40. But the most sensitive feature in his chart is the T square and its this that points to his assassination. His prophecy that he would not get there with his congregation was proved right as he was shot the following evening. Pluto in April 1968 was at 20 degrees Virgo opposite King’s apex Moon and Ray’s 8th house Sun. Pluto created a Grand Cross ( the most difficult transit possible ) in King’s chart triggering the threat of assassination that was there since birth. Was there a conspiracy ? We shall never know but just as Martin Luther King was obviously a goodie and James Earl Ray a baddie, it may be that there were people even worse waiting in the wings. Astrological armchair psychology, you can’t beat it.